silicol®gel is an oral gel containing colloidal silicic acid for the treatment of upper gastrointestinal disorders. Taken 3 times a day it helps manage symptoms and provides relief for gastrointestinal discomfort. Its therapeutic action is due to the large and reactive surface of colloidal silicic acid and its ability to act as an adsorbent. After silicol®gel is swallowed, it forms a protective and soothing coating over the lining of the stomach and intestines. Due to the adsorptive and binding qualities of colloidal silicic acid, it physically attracts and adsorbs most irritants, toxins and pathogens. This renders them harmless so that they can be removed naturally through the intestines and out of the body. Silicic acid can also bind gases and reduce excess acidity. silicol®gel is suitable for adults and children over 12 who are suffering from gastrointestinal disorders. A certified Medical Device, silicol®gel has no known side effects and can be used safely alongside other medication. To treat gastrointestinal disorders, take one tablespoon (15ml) of silicol®gel three times daily, preferably before mealtimes. After acute symptoms ease, treatment is recommended for another few days. For chronic conditions, treat for up to four weeks and then take a break to re-assess symptoms. How can silicol®gel help me? Gastrointestinal disorders are very often caused by irritants, toxins and pathogens. When the stomach or intestines are disturbed by such toxins and irritants, this can cause the digestive tract to malfunction. This can then lead to unpleasant symptoms such as diarrhoea, nausea, flatulence, stomach discomfort, heartburn, vomiting and reflux. silicol®gel contains silicic acid which is a compound of silicon and oxygen, the two most abundant elements on earth. Products containing silicic acid are widely used to treat gastrointestinal complaints and are an established therapy across much of Europe. The particles in silicol®gel provide a huge reactive surface area equivalent to hundreds of square metres per gram of liquid. A little goes a long way! The unique manufacturing process to form a colloidal gel ensures an even distribution of silicic acid particles for best performance. 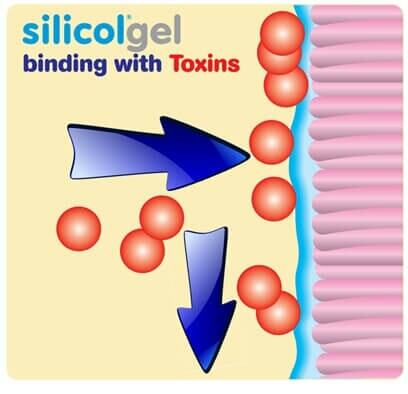 silicol®gel can be taken undiluted or mixed in water. silicol®gel is a certified Medical Device (Class II a) conforming to EU directive 93/42/EEC, and is produced in Germany by Saguna GmbH, D-33719. Read our latest blog articles below. You might also want to view the IBS Hub, featuring lots of IBS advice & information.